The first time Kyle Miyata Larson went to an auto race, he was just 3 weeks old. But while his family attended races often as fans in California, none of his relatives actually competed until his father gave him his first go-kart when he was 7, which he raced for seven years before going on to racing “sprint cars” on dirt tracks for seven more. That was when the Chip Ganassi Racing team tapped him to drive stock cars. But even if he had never made it to NASCAR, Larson said he would still be racing. 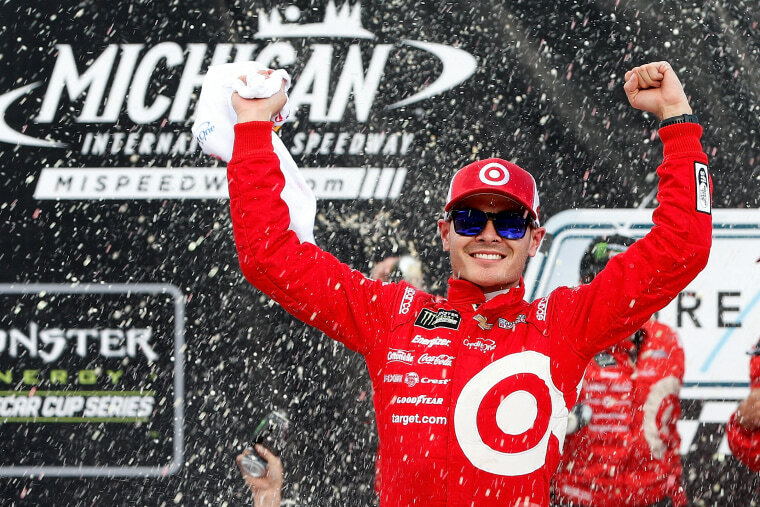 Last year, Larson — whose mother is Japanese American — became the first Asian-American driver to win a NASCAR Cup Series race, stock car racing's highest level, at the 2016 Pro Michigan 400. He’s won four more since, living up to the Rookie of the Year awards he won in 2013 as part of NASCAR's lower level Xfinity Series and in 2014 in the association's highest level. This year, he qualified for the Cup Championship Playoffs and is currently in third place. Larson’s first win was also the first time a graduate of NASCAR’s Drive for Diversity program won a race at the sport’s highest level. The program, which was established in 2004 with the aim of bringing more diversity to racing, works with both promising drivers and crew members from underrepresented backgrounds. Each year, drivers compete for spots on four regional and two local NASCAR teams. Larson differed from other program participants in that he was already signed to a team when picked, but he said that it still afforded him more exposure and experience than he would have had otherwise. While diversity data for racing is not publicly available, Larson said he has seen a change in recent years when it comes to the diversity of fans, drivers, and crews, especially on the West Coast — a change that Davis Schaefer, a spokesperson for the Chip Ganassi Racing team, echoed. “What I think is cool about being out at these West Coast races is, people who are Asian American, or have it in their heritage, they so identify with [Larson] and his background,” Schaefer said. “And we on the pit crew side are seeing more and more diversity throughout the garage." Larson said that racing's diversity is currently most apparent at the lower levels and in non-televised local races. He added that that can be hard to see because only a small percentage of drivers make it on TV. Because Larson has been a part of the sport his entire life, the lines often blur between his professional and personal lives. Even in his free time, Larson is heavily involved with the dirt track races he grew up with. He co-owns a sprint car team, and competes in dirt car racing as well as the occasional go-kart race. Larson also drives the same car, a Chevy Tahoe, on the racetrack and in his day-to-day life. But, he said, he “absolutely” felt safer driving it on the racetrack.